U.S. Navy veteran Shana Bumpas used to protect the country. Now she protects UR’s campus as its director of cybersecurity. The South Carolina native says everyone — including, yes, you — should be vigilant to keep electronic information safe and secure. What keeps me up at night would probably be a data breach — waking up the next morning and X number of student records, employee records, or other sensitive data have been exploited. Now you have to do reporting to all the constituents, and there’s the press and the reputational hit that the university would take. At the end of that, if it was something that could have been avoided — because so many of these mega-breaches that occur, it’s usually something that was totally preventable — it’s that kind of thing that just haunts you. Will things get better as we develop better tools? Look for more cybersecurity threats coming in the future, unfortunately. In this digital age, the cyberattacks are only going to increase. They’re not going to go away. They’re not going to give up. They’re not going to die off. It’s a profitable industry, so if anything, the attackers are only going to increase their attacks and improve their tactics. Again, we all have to do our part. 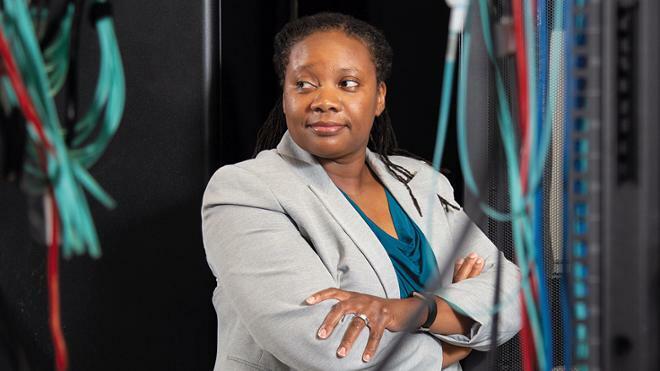 What has been your experience as a woman of color working in information technology? You know, it’s interesting. I’m working on my doctorate, and for a class project. I did a presentation about women and minorities in IT in general, how there are so few. IT tends to be a field that is dominated by men — particularly white males — and for whatever reason, people who are interested in the field, whether they’re women or minorities, it tends to be more difficult for them to break into the field. Some of it goes back to, “You need X number of years of experience,” but how do you get that experience if no one ever gives you an opportunity? In this digital age, the cyberattacks are only going to increase. When did you become interested in information technology? I started in IT probably in middle school on a good old Apple — well, actually, a Commodore 64. I would do summer camps and afterschool programs, back when software programming was in BASIC [code]. Then I was in the military, and I worked in electronics. When I got out of the military, I got back into computers and tinkered around — I got my first Tandy. That was a pretty high-speed computer at the time. How did you make the transition into cybersecurity? What do you enjoy the most about working at UR? The food is good. You really don’t have to leave campus to find something decent to eat. That’s probably not good for the waistline. But on a serious note, from what I’ve seen, everyone here is willing to help. They all want to do what’s best for the University. It’s important at home, too.